During the reception, many couples choose to provide guests with a menu of what will be served. Printing your menus at home using a free wedding menu template allows you to incorporate this unique trend into your wedding without breaking the bank. Wedding menu cards templates for free don't have to look cheap - print them on quality paper or cardstock to give them an elegant look. The three menu templates can be downloaded, customized, and printed for your use. Clicking on the image of your choice will begin a download that you can save to your desktop. The saved file will be in PDF format, so be sure you have a reader like Adobe on your computer. Then edit the text of the documents so that it fits your wedding menu and save the changed document. Finally, you can print the customized template on the paper of your choice right in your own home. A lavender menu template is a lovely option if you're having a purple themed wedding or if you selected purple and yellow or any other accent color. Click to download the lavender menu. A formal wedding reception calls for a luxurious wedding menu template. This gold option looks elegant at any soirée. Click to download the gold template. A simple gray and black flourish design is nice enough for a traditional affair yet simple enough it won't look out of place at a wedding BBQ. Print it on colored cardstock for a pop of color. Click to download the flourish design. 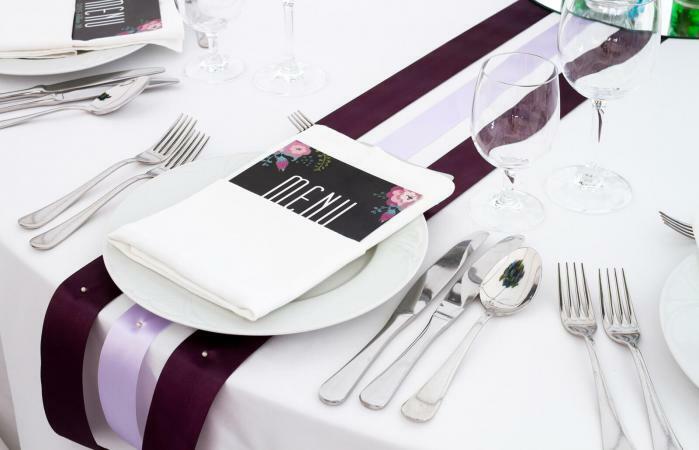 The main purpose of a menu at a wedding reception is to inform guests of the dishes and their ingredients that will be served to them. This information is particularly helpful for guests with allergies because it helps them identify which dishes to avoid or, in instances when you are serving non-traditional dishes, ones that are cultural or contain unique ingredients. Menus can also serve the purpose of telling guests that vegetarian options are available upon request, if available. Menus are a courtesy to your guests when you are serving one meal option. Using a menu at your reception when only one option is available for the meal is up to your personal preference. 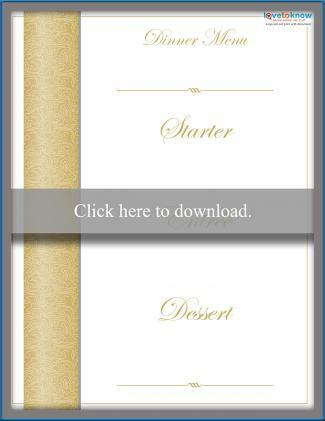 Wedding menus are not traditionally a part of a wedding. Therefore, there are no etiquette rules or standards that apply to their use. 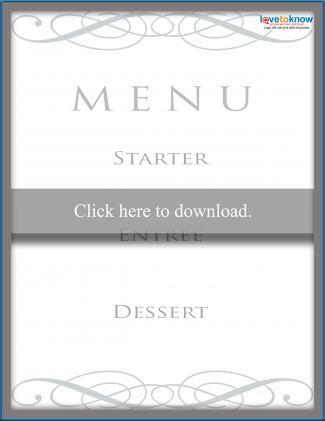 Most menus are typically no longer than a single page and only printed on one side. They may be a flat card, a tented card, or a flip card. Be as specific as possible about the dishes to be served, but don't go overboard. This helps guests know what is coming their way without leading to an overwhelmingly dense menu card. Menus can be placed at individual seats or one or two per table when the meal is being served. Placing just one or two at each table cuts down on costs as well as waste. Most menu cards are put aside and not looked at again after the meal, and guests do not mind sharing a menu with fellow table members. At a buffet, a single, larger-sized menu can be placed at the end of the buffet table instead of at each table or setting. This option allows guests to see what is offered on the buffet before making their selections. Wedding Chicks offers the Monogram Printable Menu Template which contains the couple's monogram at the top. It can be downloaded directly to your desktop, at which point you can use Photoshop or another software program of your choice to add your menu details. The same design on invitations, response cards, and table menus are also available in template form for free. 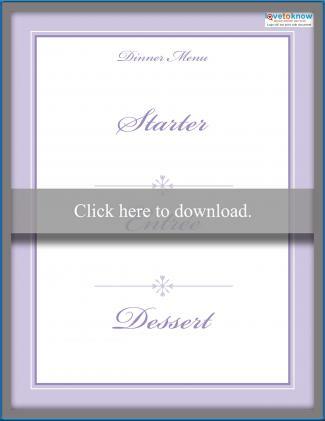 Wedding Menu Template offers several free templates for wedding menus. Templates can be downloaded and customized in either Word or Corel Draw format. Templates contain decorative elements at the top and bottom, such as swirls, as well as the names of the couple and the wedding date. Business Templates offers a printable free wedding menu template featuring a border and two interlocking hearts on the bottom right corner. Click the bright green download button to get the .zip file. Dill Pickle Picnic offers a menu template that is downloaded into a Word document. Three menus will print onto one 8.5 x 11 inch piece of paper. Once you've selected your menu, you can have fun customizing a menu card detailing your selections. Fortunately, with free templates your menu cards do not need to consume a large portion of your budget.